This beautifully perfumed evergreen salvia is native to Honduras. It is a shrubby plant to about 1.5m with large soft furry leaves which have a fruity smell. 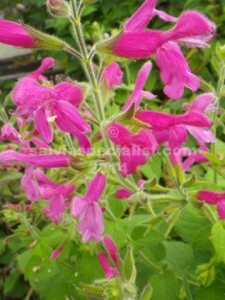 Good sized solid pink flowers appear late winter onwards. The timing isn’t great if you are in a frosty area as it is fairly tender, however it can be grown under an evergreen tree for protection. It is not drought hardy. Some stems could be pruned out after flowering. It can be propagated by cuttings.